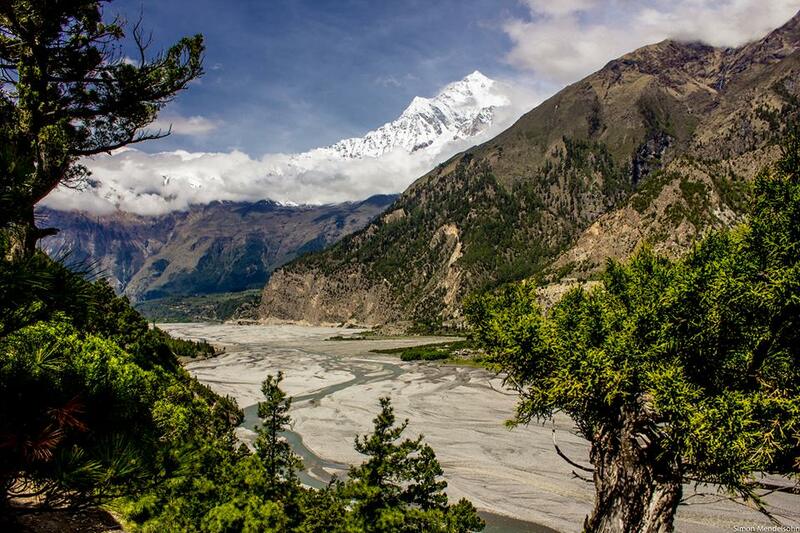 North Annapurna Nar- Phu Trekking, one of the most spectacular walks full of view within cultural and traditional villages of Manang areas, as our route leads from low warm country to reach high hills of cooler alpine temperatures and then to arctic zone of remorseless fields of ice and glaciers at Kang-la and Thorang-la passes. Explorer Adventure offers North Annapurna Nar-Phu Trekking which falls on semi Annapurna circuit route that ends at Jomsom town within Mustang areas after great fascinating walk into remote and isolated region of Upper Manang Valley at Nar Phu villages, where few trekkers and adventurer seldom visits this mystical and fascinating wild country of Nepal Far North West in between Annapurna and Damodar range of mountains. 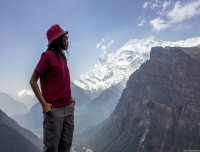 Adventure begins with exciting and interesting drive from the capital Kathmandu towards Nepal Mid West country at warmer areas at Besisar headquarter town of Lamjung district and then following the raging Masrsyangdi River upstream, as our walk follows high along with fast flowing rivers towards high and scenic Manang valley. Walking past nice charming villages of Jagat-Tal-Dharapani and Timang from Syange heading into nice cool shade of alpine woodland with daily views of mountains which includes Lamjung Himal,Manaslu range with Annapurna II and Annapurna IV. Enjoying tremendous views and scenery on walks within beautiful landscapes and cultural villages of Buddhist and Tibetan origin and religion where you will encounter many rows of prayer monuments as walk progress towards Kotto village near Chame town. From Kotto leaving the main Annapurna Circuit trail heading towards remote and isolated wild country to reach first at Phu village around weather beaten areas with eye-catching views of mountains and exploring the local cultural villages and old monasteries. Then walking towards to cross a first high Kang-La pass with time visiting nice Nar village and its colorful custom of great interest, slowly adventure leads over 5,322 m high pass with glamorous panorama of snow clad peaks and landscapes, where walk leads back on the main trail of Annapurna circuit to reach at main Manang village. Manang a scenic village close to mountains and glacial lakes with fascinating houses with good lodges to stay, from here heading towards our second big high pass at Thorang-la above 5,416 m with spectacular views of Dhaulagiri, Damodar Himal, Annapurna range with Mustang Himal. Finally our last walk of the adventure concludes at Jomsom after holy Muktinath temple premises where a scenic short flight brings you at scenic Pokhara by its serene Phewa Lake for last overnight stop around Annapurna region with fabulous and exciting adventure on North Annapurna Nar- Phu Trekking. 1 Day 1: Arrival in Kathmandu and transfer to hotels.On reaching Kathmandu Tribhuwan International Airport where you will be warmly received by our guide and staff and then transfer you to your respective hotels in the hub of Kathmandu city. First check into your hotel rooms on getting refreshed from the flight and with Jet-Lag, then join with other members of North Annapurna Nar- Phu trekking for group briefing, where our expert guides will inform regarding your stay in Nepal, hotels, trekking, local lodge and overland drives with do’s and don’ts information, evening welcome group dinner in authentic Nepalese restaurants with Folk cultural programs to entertain you during your meals. 2 Day 2: In Kathmandu with sightseeing tour around world heritage sites.Morning after breakfast leave the hotel for exciting guided sightseeing around Kathmandu where our city guide will lead you to places of interest, Kathmandu a metropolitan city still retains its ancient heritage and varied ancient culture where you will visit world heritage sites around Kathmandu for half day or full day. After an interesting and wonderful tour of ancient historical and religious sites around Kathmandu, with afternoon free preparation for next day journey to Nepal Mid West on North Annapurna Nar- Phu Trekking. 3 Day 3: Drive to Syange 1,140m via Besisar - 06 hrs.Morning taking an exciting drive with scenic views of Himalayan peaks, as ride leads on Nepal’s busy highway past many towns and farm villages then reaching at Nepal Mid West warmer areas at Lamjung district, and the continue drive past Besisar (headquarter town of Lamjung district) following Masrsyangdi River to reach at Syange village for overnight stop with views of wonderful waterfalls nearby. 4 Day 4: Trek to Dharapani 1,943 m - 06 hrs.From Syange walk begins with climb on leaving Masrsyangdi River behind reaching at Jagat village, a farm village with many lodges for trekkers, after Jagat walk leads on winding path to Chamje, and back at Masrsyangdi River crossing to east side into forested area, with super views of Annapurna and Manaslu mountain ranges. As walk continues reaching a nice village at Tal Besi, from here few hours walk leads to our overnight stop at Dharapani village, located on the midway of Annapurna circuit and Manaslu trekking trail. 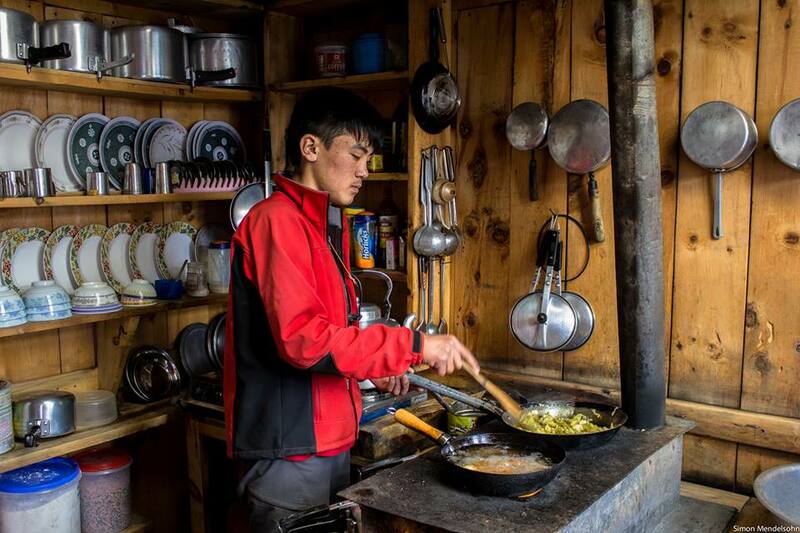 5 Day 5: Trek to Kotto 2,680 m near to Chame town 2,720m - 05 hrs.After Dharapani walk leads into rhododendron and pine forest passing villages of Bagarchap and Danque, then at Timang village with more Buddhist cultured village including views of Mt. Manaslu 8,163m / 26,781ft. From Timang village few hours trek to Kotto for overnight stop which is near to headquarter town of Chame, with enough time in the afternoon at Kotto where a stroll to Chame will be interesting walks. 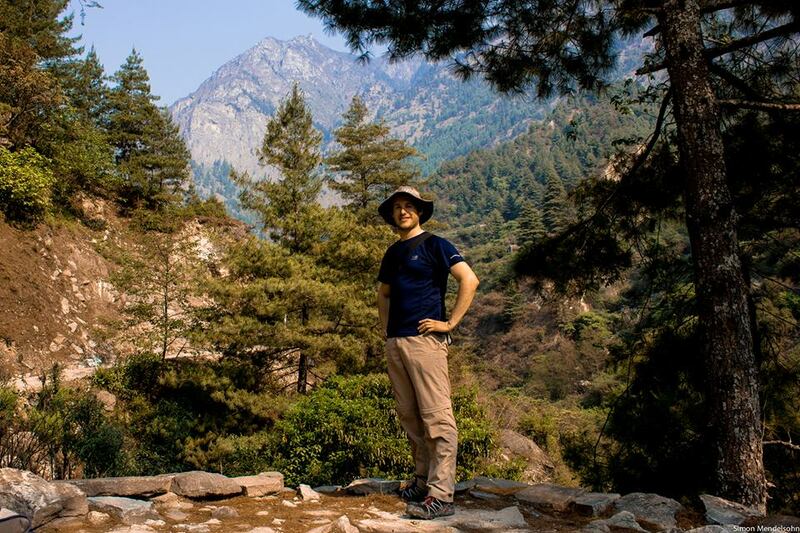 6 Day 6: Trek to Dharmashala 3,230m - 05 hours.After Koto our route heads north away from Annapurna circuit trail for a week heading towards Nar & Phu villages, in the hidden areas of Upper Manang valley near South West Tibet border in the country of blue sheep’s and snow leopards. 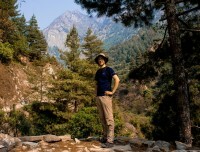 Trek leads into narrow valley with forest of pines and rhododendron trees, then reaching nice pasture fields with huts and sheds of Yak herders and in the gorge formed by Pisang Peak and Kang-guru Himal lower basin, walk continues following Nar-Phu River upstream to reach at Dharmashala for overnight stop. 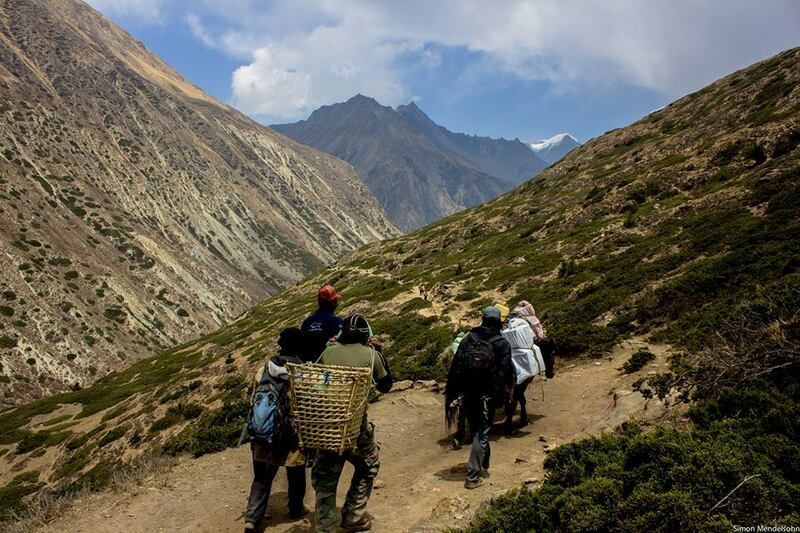 7 Day 7: Trek to Kyang 4,100 m - 6 hrs.Morning walk leads towards far north towards Phu village isolated area of dry, arid landscapes, on the lookout for some wildlife’s Blue Sheep’s, Snow Leopard, Musk deer’s and mountain goats. 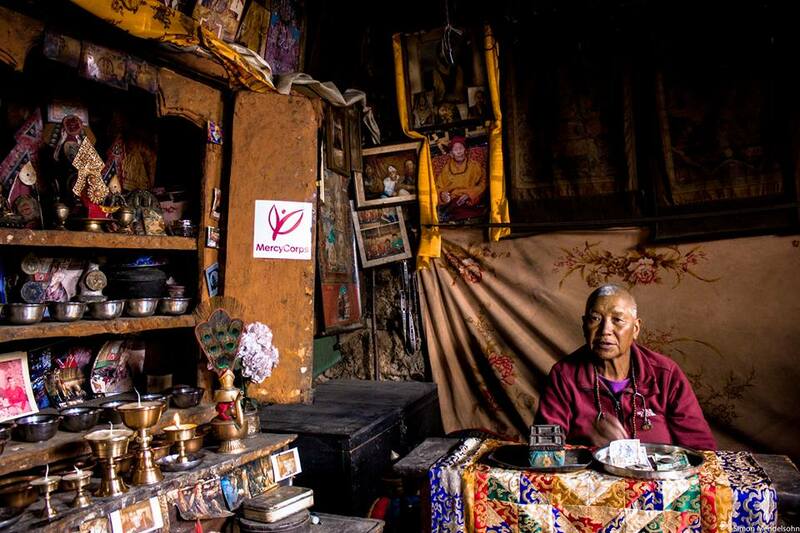 Walk continues to Kyang for overnight stop after an interesting day, Kyang with dozen houses of Tibetan culture. 8 Day 8: Trek to Phu village 4,080 m - 06 hours.Today destination to Phu village morning walk towards Phu River following upstream for some time and then descending back to river again, then climb to reach a gorge valley, walking around gorge for some time and up into a wide glacial valley with pasture lands ending at Phu village of strong Tibetan influence culture, traditions and religion. 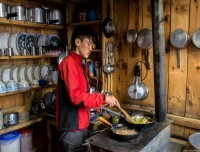 9 Day 9: Rest day at Phu village and hike around Phu village and valleyA necessary rest day at Phu for acclimatization, explore this impressive village visit Tashilkhang and Samdu Choling Monastery and Kyachu waterfalls, Phu Village with about 30 houses for 100 to 150 inhabitants. 10 Day 10: Trek to Nar Phedi 3,545 m - 06 hrs.From Phu village walk leads back on the same trail for few hours descending to a narrow gorge at Phu khola, from here a slow climb to reach at Yughat small village with mani, chortens and Buddhist shrines, then finally reaching on a flat field at Nar Phedi for overnight stop. 11 Day 11: Day 11 : Trek to Nar-Gaon 4,206 m - 06 hrs.Morning walk leads back to Phu Khola for few hours to reach a suspension bridge over Phu Khola, crossing the bridge with steep climb for few hours reaching a flat area then walk to Nar village for overnight. Nar-Gaon in comparison with Phu looks similar but smaller due to its remoteness with high much altitude and arid dry land. 12 Day 12: Trek to Kang-La Base Camp 4,530 m - 05 hrs.After Nar-Gaon walk heads to remote wilderness, away from human settlement for few days, an interesting walk for few hours then with short ups and downs in some rocky and arid path, passing cattle herders shelters and grazing field heading further west following Temdenzon Khola (stream) around this wild areas with views of peaks and finally reaching at Kang la pass Phedi or a base for overnight stop with camping at 4,530 meters altitude. 13 Day 13: Cross Kangla Pass 5,322m and trek to Ngawal 3,650 m - 07 hrs.Starting early morning to cross over Kang-la at 5,322 meters, walk climbs higher on steep slope for few hours with fabulous views of Pisang Peak with Chulu Far East Peak, and then reaching on top of the pass with breath-taking views of Annapurna massif mountain range includes Chulu Peaks, Lamjung Himal and adjoining peaks of Annapurna range, and then walk downhill to Ngawal via Julu village close to Manang village to reach near the main route of Annapurna circuit trail. 14 Day 14: Trek to Manang 3,540 m - 04 hrs.Morning views of mountains, from here downhill and pleasant scenic walks with short uphill facing views of Annapurna II and III, Gangapurna Chulus and Pisang peak. Walking leads past Hongde village, from here onward tree lines fades for barren, arid landscapes with cold, dry arctic climate. 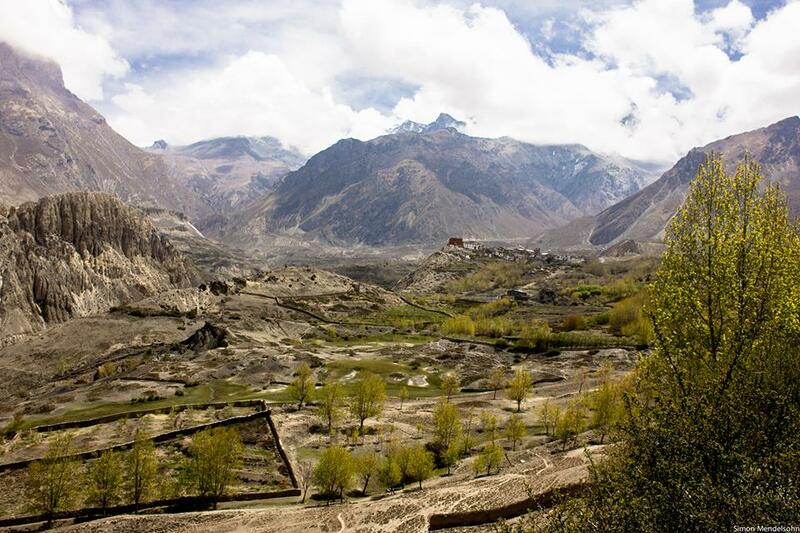 Before Manang, visit old Braga monastery with old Buddhist relics, ancient wall painting and frescos and stunning views of Annapurna Himalaya, from here an hour walk reaches at Manang village. Manang village, situated on windswept valley by the bank of Masrsyangdi River beneath Annapurna and Gangapurna mountain range, a nice walk uphill for views of Gangapurna Glacier and Manang glacial Lake. 15 Day 15: Trek to Yak Kharka 4,210m - 04 hrs.After a good rest and overnight at Manang walk towards Ghunsang village with short uphill to reach at Yak Kharka, an interesting walk with views of snowcapped mountains, on crossing a small stream reaching Yak Kharka for overnight stop, a small settlement with views of Gangapurna, Annapurna III and Chulu Peaks. 16 Day 16: Trek to Thorang- La High Camp or Phedi 4,450 m - 04 hrs.Morning walk lead to more high elevation getting closer at the base of Thorang-la after crossing a bridge with a climb along the river bank of Jarjung, finally walk leads at Thorang Phedi, here depending upon the physical conditions of the clients, if all goes well an hour steep climb to Thorang High Camp for overnight stop. 17 Day 17: Cross Thorang La 5,416 m / 17,769 ft and descend to Muktinath 3,800 m- 06 hrs.One of the highlight and Big Day of the adventure, after early breakfast walk leads to a long climb to Thorang-la on steep winding path to reach Thorang La Pass at 5,416 m decorated with thousands of colorful Buddhist prayer flags with board mentioning name and height of the pass. 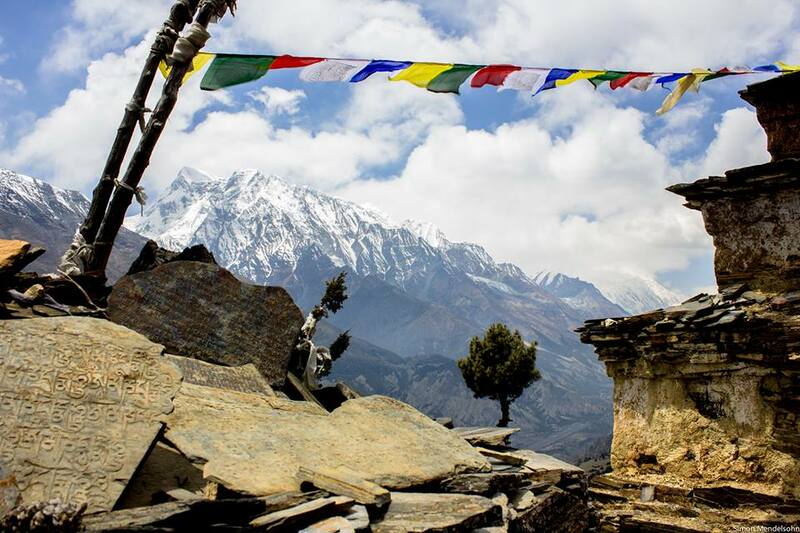 The highest point of the adventure with views of snowcapped peaks, and then with long descends to reach at holy Muktinath around Lower Mustang area. On reaching Muktinath for overnight stop, this is a holy spot for both Hindus and Buddhists the word Muktinath literally means ‘the place for Nirvana or Liberation’. 18 Day 18: Drive to Jomsom 2,715 m - 02 hrs afternoon free at leisure to explore the town.From this peaceful religious and holy site of Muktinath with views of Dhaulagiri range, at Muktinath our trekking completes taking a ride to reach lower areas of Mustang, since the motor-able came walking is disturbed by movement of vehicles, so taking a drive instead of walking. Drive leads towards wide Kaligandaki River within its windswept landscapes to reach at Jomsom the headquarter town of Mustang area, an interesting town inhabited by Thakali people of Buddhism religion, as these tribe on long history of trade with Tibet as this town situated on main old Trans Himalayan salt and caravan trade of Nepal and Tibet. With time here to enjoy walks and observe the local people fascinating culture and traditions. 19 Day 19: Fly to Pokhara 860 m - 22 mins and transfer to hotel by the lake of Phewa.Our last day of the adventure early morning walk to Jomsom small airport for super scenic short flight to land at picturesque Pokhara and then transfer to respective hotels by the Phewa lake side. 20 Day 20: Drive or fly to Kathmandu and then transfer to your hotels.Morning transfer either car-coach or tourist bus (as per the size of the group), for drive back to Kathmandu with scenic views of mountains, green scenery of hills and farm fields within nice villages and towns as drive brings you back at hustle and bustle city life of Kathmandu. 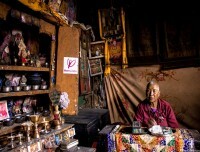 On reaching Kathmandu transfer to your respective hotels with time for individual activities and shopping souvenirs. 21 Day 21: Depart for international flight home ward bound or to respective countries.Your last memorable day in Nepal after a wonderful adventure and experience on North Annapurna Nar- Phu Trekking with great service of Explorer Adventure, and as per your international flight then transfer to Kathmandu international airport for homeward bound or to your respective destinations. 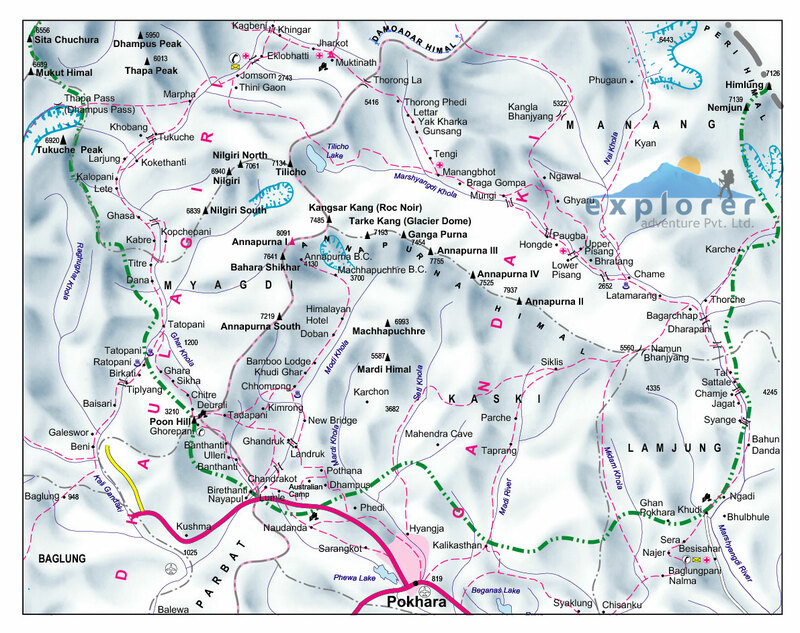 Highest elevation gain: At Kang-la 5,322 m with Thorang-La pass 5,416 m high. 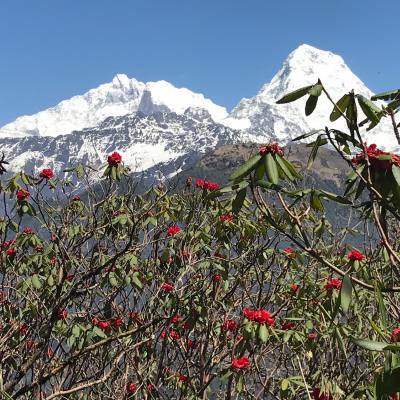 Season: March to June and September to November months March to May wild flowers in bloom with clear morning might get cloudy late afternoon times, October to November clear day for views but can be very cold in the morning and night time above 2,000 m high.